Applications are invited from the intending candidates in the Standard Form of application for filling up the post of "Revenue Sheristadar' in the office of the Deputy Commissioner, Dibrugarh in the scale of pay Band (PB-3 + Grade Pay (Rs. 22800-87000+ Rs. 11.500/-) pm plus other allowances as admissible as per provision of R.O.P. 2017 and under the Assam Ministerial District Establishment Service Rule 1967 as amended. 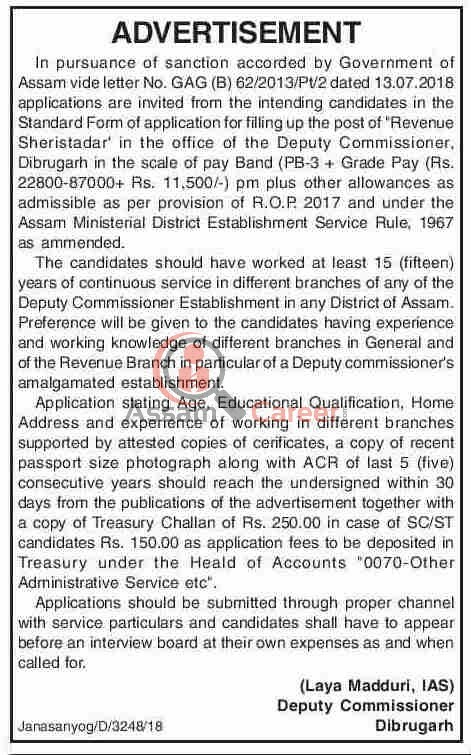 Eligibility: The candidates should have worked at least 15 (fifteen) years of continuous service in different branches of any of the Deputy Commissioner Establishment in any District of Assam. Preference will be given to the candidates having experience and working knowledge of different branches in General and of the Revenue Branch in particular of a Deputy commissioner's amalgamated establishment. How to apply: Application stating Age, Educational Qualification, Home Address and experience of working in different branches supported by attested copies of certificates, a copy of recent passport size photograph along with ACR of last 5 (five) consecutive years should reach the Deputy Commissioner, Dibrugarh within 30 days [27/07/2018] from the publications of the advertisement together with a copy of Treasury Challan of Rs. 250.00 in case of SC/ST candidates Rs. 150.00 as application fees to be deposited in Treasury under the Head of Accounts "0070-Other Administrative Service etc". Applications should be submitted through proper channel with service particulars and candidates shall have to appear before an interview board at their own expenses as and when called for.